I’ve often seen INFJs described as an intensely spiritual type. Yet a little while ago, in an online INFJ group, someone posted that most INFJs are atheist or agnostic. Being a type that appreciates truth, someone else set up a poll trying to see if that was really the case. It’s a small, volunteer sample group, but the results were interesting. 36% identified as atheist, agnostic or non-religious. That’s the same percentage that identified with a Christian religious sect. The remaining 28% identified as “spiritual” or with a non-Christian religion. INFJs approach religion much like we approach everything else: with an open, inquisitive mind looking for patterns, especially those relating to people. Our relationship with spirituality largely depends on how we were raised and the direction our lives took from there. But it also depends on our journeys of personal growth, how the religions we encounter line-up with our convictions, and whether or not faith “makes sense” to us. Many INFJs I’ve seen talking about being non-religious started out in a church of some sort and then left. As with many people who leave churches, hypocrisy is often cited as the reason. INFJs are exceptionally good at detecting deception. We can read people well and pick up on inconsistencies in their patterns of behavior very quickly. At the same time, we want to believe the best of people and it can take a long time for us to admit someone who we value would betray us. When we do “wake up” to deception or decide we’ve had enough, the reaction is typically quick and decisive (hence the INFJ door slam). A hurt, disillusioned INFJ might door slam the people who betrayed them, religion itself, or even God. Some shift to a different religion that lines-up with their core values. Some maintain a sense of spiritualism without any sort of structure that could qualify as “religion.” Others reject religion entirely. 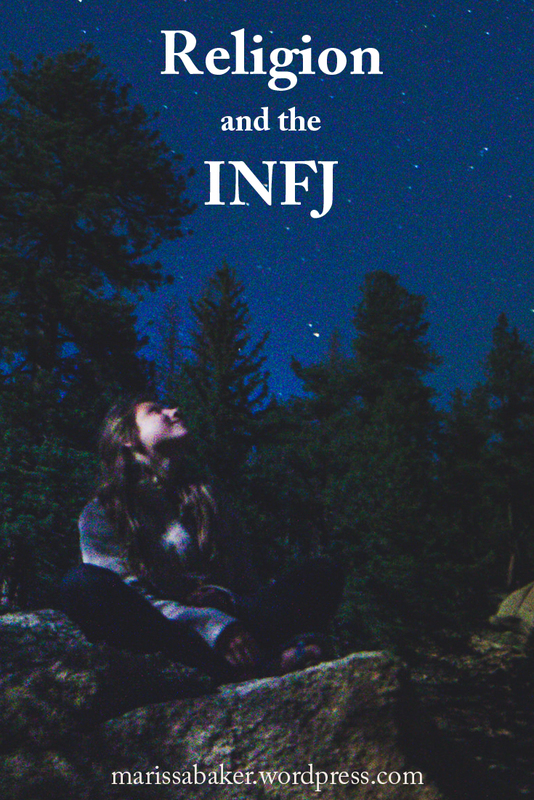 INFJs are rarely described as “sensible.” But even at our most otherworldly and abstract, we want things to make sense to us. It doesn’t have to fit anyone else’s way of thinking, but it has to fit the INFJ. We don’t appreciate self-deception any more than we do having someone else mislead us. If an INFJ’s religious beliefs don’t fit into how they believe the world works, they won’t be happy. Religion should make the world make more, not less, sense to an INFJ. If it doesn’t, they’ll find another explanation (typically turning to science and rational thinking, perhaps blended with spirituality). INFJs are content with recognizing not everything can be explained in a logical fashion, but they want their beliefs to fit with the explanations they have. If we put our faith in something larger than ourselves, we want it to answer questions for us and be a safe place to ask more questions about life, the universe, and everything. INFJs seek connection to something larger than ourselves, and many of us do that within a spiritual belief system. 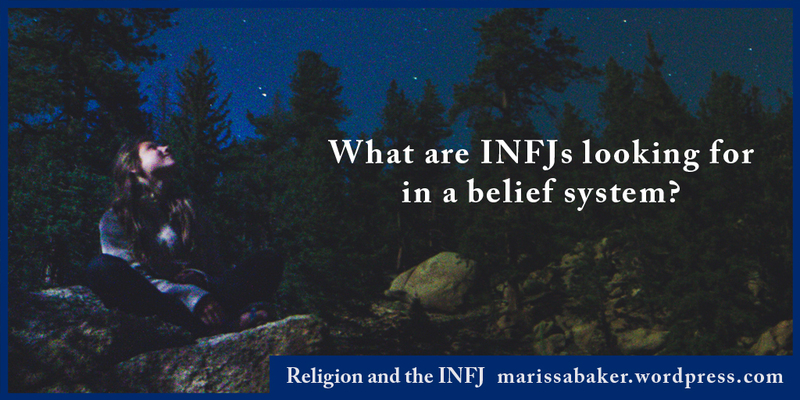 We often find belonging in an established religion, but it’s also an INFJ thing to walk out your own beliefs in your own way. The more mature, confident, and comfortable with themselves an INFJ is, the more they’ll “do their own thing.” It’ll be in a peaceful, respectful, and non-confrontational fashion (unless you try to hurt an innocent or cross us on a deeply held principle), but we will stay true to our convictions. Personally, I hit a point in my late teen years where I nearly walked away from organized religion. I think a large part of why I didn’t was that my family always encouraged developing a relationship with God independent of any church group. But they also taught me that fellowship with other believers is important and I shouldn’t blame God or good people for the actions of the bad apples in any given group. Over a few rather trying years, both those things became part of my personal beliefs rather than just something I’d been taught. At the same time, my faith in God deepened and became so much a part of who I am that I define myself as “Christian” before anything else, including INFJ. I’m sure many religious INFJs have a similar story. There was a point where you had to decide what you believed and how you were going to live your life, regardless of what other people thought, said, or did. If you’re happily, devotedly attached to a faith it’s likely because it has become part of your core identity. What about you? What has your religious and/or spiritual journey as an INFJ (or any other type who wants to weigh-in) looked like? Having very “not positive” experiences with organized religion, I am not a fan… for myself. Others find it comforting and helpful and I’m glad they have it. I can’t say whether there is a higher being or not. I can say it doesn’t matter to me as I don’t feel it relates much to me and my life. However, I do acknowledge that I feel a sort of life and maybe even awareness seems to thrum through the world around me and I want there to be magic in everything. I “adopt” broken things and the “lasts” of stuff like the last of a certain kind of stuffed animal on a shelf or a stuffed bear my husband brought me because it had no nose and he was sad for it and because it would probably end up in the trash and not even recycled because someone else me a mistake in building him. I didn’t fix it though because I also didn’t want to send the message to any of the others that he wasn’t perfect just as he was. For me, organized religion very much valued conformity and I can’t do that. I am good just like this. I feel that as long as I love as many and as much as I am able and try very hard to do the right thing and be a good person, no higher being that makes any sense to me could possibly find fault with that. Also, like I care. Plus, while I am glad to have friends who seem to tolerate and expect my weirdness and I talk a mile a minute, just a good hug from one person who just loves me and will let me do my own thing works much better for me. The talking, btw, is called “pressured speech”. My religion makes sense, and it goes much deeper than most are willing to delve. The Catholic faith is about that inexplicable mystery that is known by being felt by the heart rather than understood by the mind. As a INFJ I find that sometimes I know things, but I don’t always know exactly from where. I don’t generate this knowledge and insight by myself, it’s a gift given to me, and others by a power that puts things in their proper place in the Universe, God. I’m sorry there are people out there who feel hurt and betrayed by religion, but geez, look at the big picture. Was it Christ who let you down, or was it people? As a INFJ, you should sense hypocrites — don’t let them hurt you.